I’m on the road again (this time…Detroit), so I apologize for being absent today…and for not commenting on everyone’s beautiful baby pictures (I swear, all these blogs with all these babies…you’re giving me baby fever). 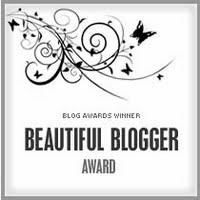 However, I did want to acknowledge Abi for giving me the Beautiful Blogger award the other day. Thank you so much! Part of receiving this award requires that I tell you ten things about myself. I thought instead, I’d answer ten random questions that I found at Bridgetown Baby Momma. Do you parallel park or drive around the block? In NC, we don’t have to parallel park in order to pass a driver’s test (I just learned this was very different from other places). I can parallel park decently, but it’s just not something I have to do so I’d have to say I probably would just drive around the block. Is there one thing that all your love interests have had in common? Entrepreneurial spirit – I guess I have a thing for driven, determined men…and I suppose that makes sense since I am more of a creative type – someone has to balance me out. How often do you clean out your ears? Probably a few times a week, but I’m not religious about it. What is your favorite time of day? My husband would tell you that no time is my favorite. I think I’m a morning person…but not until I’ve had my morning coffee. Do you go to church? Yes, we do – we go to a non-denominational church and LOVE IT! I think our attitude about church, religious and faith is very different than our parents. We love that we can go to church on Saturday evening. What is something that makes you cringe? Makes me cringe…pure nastiness for no reason (saw this guy on America’s Got Talent putting a drill through his nose – there’s no sense in that). Pet peeve? I hate being told what to do or how to do something. How well/fast do you type? I definitely type faster than I write…I sometimes type faster than I think. I don’t recall this being something I practiced, but I’m of the generation that grew up in front of a computer. Amazingly enough, I don’t think my brother and sister type very fast and they are younger. What qualities you look for in a friend … in other words, what causes you to really “click” with someone? I like people that I can be real with…I like people that have a sense of humor…that know how to make fun of themselves…that can think outside the box…that have a creative mind…that have a generous spirit…that love to love…I could go on and on. Melissa at Storytime: she recently won In a Yellow House‘s photo challenge for summer. Beautiful shot! A. Shirk at 365 and Beyond: I just rolled through Google Reader and her macros blow my mind. Amanda, you really should be entering Macro Friday. She also recently redesigned her blog…go check it out. Melissa D. at A Family in Love: she’s been providing me with editing photos (I’ve got the second one coming soon) and is a regular commenter. I like comments! Courtney at One Mom’s Perfect Imperfection: another one of my regular commenters, Courtney is full of creative ideas. Dave at The Hidden Realm: Dave is a new follower of my blog…and I to his blog. I’m such a fan of his photographs – so bare, naked and real. Definitely worth checking out. Care at The Exposed Mom: Care has also been supporting me with photographs (she just sent me one to edit in fact, so stay tuned). I love watching her family grow up through photographs. The Paper Mama: another mama with a photo challenge. I don’t participate in her photo challenges because I’d really be exploiting my “child (Kitty Paw),” but she’s worth checking out. Holly at Pet-ography: for all of us that love our pets, her blog is all about photographing animals. There are so many more deserving blogs, but I’m tired…I need to go to the gym…and then I need to edit at least one photograph tonight as well as set up my challenges for the rest of the week. Have a great week!